To adjust surveys display setting, go to View > Map View> Display tab. Surveys: Show/hide survey lines in the map view. 2D Line Names: Show/hide the 2D line names and change the line name font size (default 12). 2D Selected Lines: Show/hide selected 2D lines. 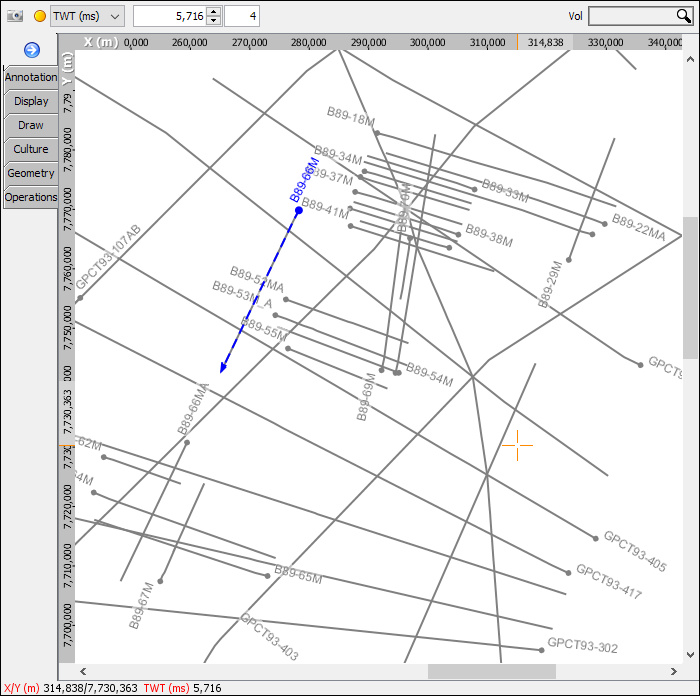 3D Grid Lines: Show/hide the grid line of the 3D survey. 3D Survey Numbers: Show/hide the survey numbers and change the number font size (default 9). Note: The survey lines can be customised to different colours, see Defining Survey Details. This map shows a 2D survey (in grey) with a line selected (in blue). To select a single line, hold Shift and click on any line. This will clear any existing selections. To select multiple lines, or deselect a line, hold Ctrl (Windows and Linux) or Cmd (Mac OS) and click on any line(s). Right-click on any selected lines and choose "Show n lines in 3D view". Multiple lines selected in this way will all be displayed simultaneously in the 3D View. Note: Multiple section views must be open for multi-select to work. A 3D survey defines the relationship between IL/CL and X/Y, and does not include boundaries. The size of the 3D survey drawn on the Map view is the union of all of the volumes and horizons using the survey. If a survey seems unusually large, check that horizons and volumes are assigned to the correct survey. The navigation markers (red bold lines on Survey 1) indicate the location currently displayed in the IL/CL View and 3D View. The navigation marker colour matches the display settings for each view. Click and drag the navigation markers to reposition the views. Double-click in the map view to set the IL/CL location of all linked IL/CL views (see Linking Multiple Views). 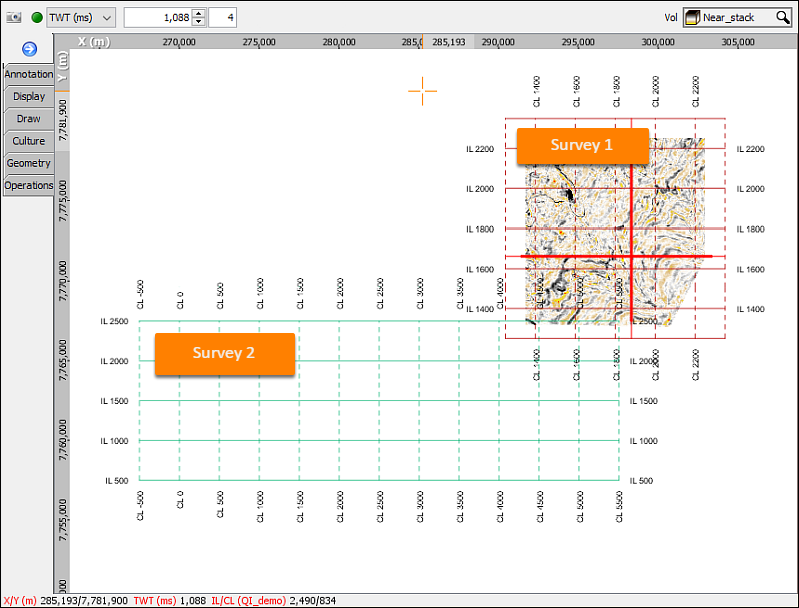 Tip: An IL/CL view can display IL/CL positions from any loaded 3D survey. Only the currrently selected survey for the IL/CL view will have navigation markers. 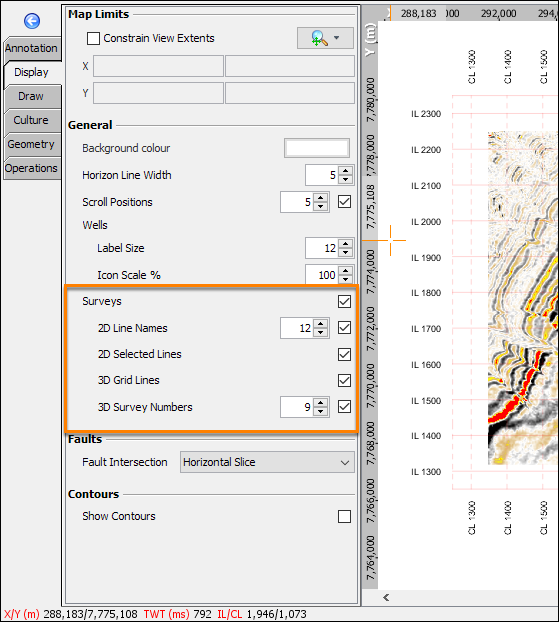 Find out about different 3D surveys in IL/CL views (see Selecting 3D surveys in IL/CL View).